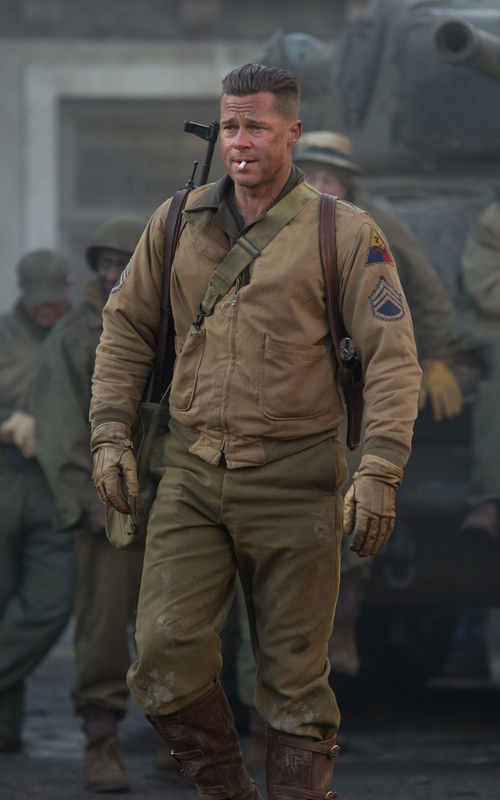 Set in the final weeks of World War II, Fury is a brutally honest movie depicting the true face of war. Ground combat is dirty, cold, dangerous. War exacts a terrible cost from those who survive to return home. David Ayer’s magnum opus, Fury, depicts World War II as it happened without glorifying the unforgiving violence, death, and carnage of battle. 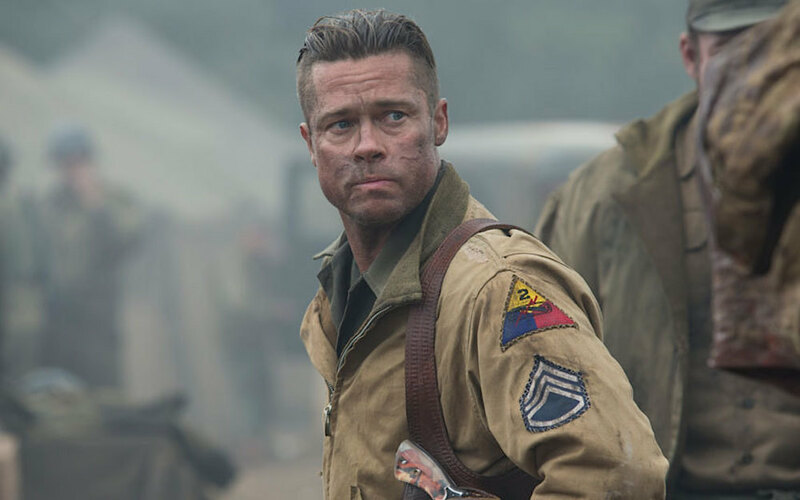 Brad Pitt portrays Staff Sergeant Don “Wardaddy” Collier, a hardened veteran and commander of an M4 Sherman tank nicknamed “Fury”. Very little of Wardaddy’s background is directly revealed in the film although a number of clues point to his prior combat experience in World War I and perhaps service during in interwar years. As such, Collier is an “old school” tanker with a preference for uniforms first introduced before the start of WWII. Not surprisingly for a man with his personality and the inclement weather, Wardaddy wears the infamous tanker jacket throughout most of the film. While tank crews have periscopes and vision blocks that allow them to see, at least partially, when “buttoned up” most commanders prefer to ride outside the hatch for greater visibility or to employ the commander’s .30-caliber machine gun. As such, they are exposed to both the elements and hostile fire. S/Sgt. Collier commands an M4 Sherman “Easy Eight” tank, flanked by the Browning M1919A4 .30-caliber and Browning M2 .50-caliber machine guns. Collier’s tanker jacket, officially known as the “jacket, combat, winter” is made from 100% cotton twill in the familiar OD shade #3. Wardaddy hand-stitched his staff sergeant rank and division patch on the coat and repaired the right elbow with a large rectangular shaped patch. Wardaddy’s 2nd Armored Division patch and staff sergeant insignia appear to have been hand-stitched to his tanker jacket. The coat has an interior wool lining for warmth and is water repellent. The jacket has knitted elastic cuffs and waistband to keep out the cold and two large pockets with horizontal openings. Wardaddy improved his standard brass zipper with a field expedient solution – namely a discarded grenade ring which allows him to use the zipper while wearing gloves. Wardaddy considers his options after Pvt. Norman “Machine” Ellison informs him of the advancing SS troops. Collier’s pants and shirt are both M1937 pattern wool in olive drab shade #3. This author owns original versions of both items and can personally attest to their warmth, heavier weight when contrasted to today’s uniforms, and durability. The wool pants feature five pockets similar to a modern pair of Levi’s and a button fly closed with five plastic buttons. As these pants were initially designed for both garrison and field duty, they are reinforced with stronger stitching along the outseam, inseam and the seat. Collier wears a M1937 cotton khaki web belt that is 1.25″ wide and easily adjusted with the open-faced buckle. This style of web belt was issued in one standard length and cut to fit the wearer. The belt has a brass tip on one end to prevent fraying when run through the buckle while the cut end is “sealed” by melting with a lighter. Wardaddy freshens up in Irma and Emma’s apartment. Collier tucks his trousers into a pair of M1940 mounted cavalry service boots first designed for true horse cavalry and perhaps providing a further clue to his past. The boots are made of brown leather and have laces to the ankle and rubber soles perfect for retaining one’s footing whilst climbing on tanks. The high shank, secured with three brass buckles, offers some defense for the shins in the cramped tank interior. 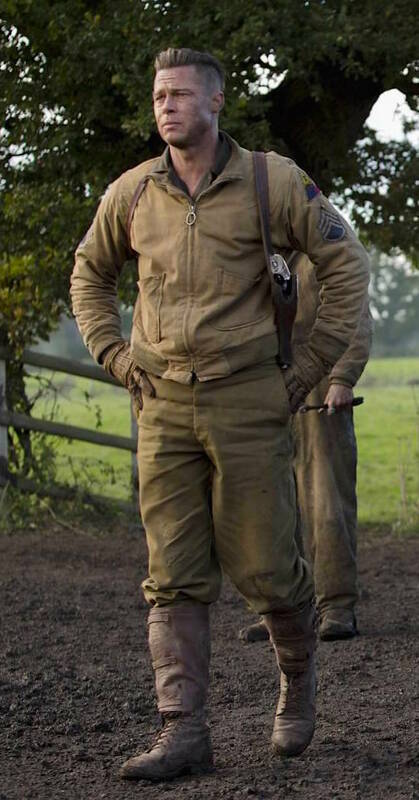 Norman Ellison (Logan Lerman) spends more time than one would expect in close proximity to Wardaddy’s boots. Wardaddy sheathes a large combat knife with a wooden handle in his right boot. Exact details of the knife remain a mystery although the blade bears a very strong resemblance to a German-issued World War I trench knife… perhaps retained from a fallen opponent. Wardaddy’s M1937 wool shirt is of similar shade to his trousers. The placket and wrists are closed with brown plastic buttons as are the two square chest pockets. Unlike today’s U.S. Army combat uniforms, the M1937 was cut like a men’s dress shirt – i.e. issued by neck and sleeve sizes. As with the pants, the shirt is heavier than modern clothing with a weight of 1.5 pounds when dry and much, much heavier when wet. Wardaddy hand sewed his rank chevrons on the sleeves with the 2nd Armored Division unit patch on his upper left sleeve. Norman and Wardaddy briefly “play house” with Emma and Irma before a mission calls them away. Wool is itchy, Collier is a practical man, and Germany is cold in the winter and spring – thus Wardaddy dons a long-sleeved khaki-colored cotton t-shirt as his base layer under the M1937 wool shirt. Collier also wears his dog tags and a plain analog watch. Any port in a storm… Wardaddy cleans and shaves his face during a brief respite. Collier also wears a pair of M1939 tan leather horsehide gloves to further protect his hands. These gloves are most certainly nor warm nor waterproof but allow the wearer a greater range of dexterity and motion than true winter gloves. Wardaddy uses two helmets, occasionally combined for additional protection, throughout Fury. Tank crews were issued an M1938 helmet made of compressed cardboard with a leather exterior and brass hardware chinstrap. Allied tank crews employed internal communication through the helmet’s earphones which drastically improved their ability to function as a tank team. The M1938 was solely designed to prevent head injury from accidents inevitable to driving and working on a multi-ton steel tank. The M1938 offered zero defense against bullets, artillery or the other hazards extant on a WWII battlefield which is why Collier wears the iconic M1 steel helmet, sans liner, when expecting enemy contact. Wardaddy, dressed for battle in his M1 helmet. Like most of the tank crew, Collier has a pair of dust goggles attached to the top of his helmet. Even on improved roads, mechanized vehicles throw up a tremendous amount of dust when in column formation requiring the use of goggles on the move. Collier uniquely wears a pair of German army TG1223 model dust goggles with rubber frames and glass lenses likely captured from the enemy. All of Wardaddy’s clothing is available for private purchase online. Wardaddy’s weapon of choice is a M1917 revolver made by Smith & Wesson in the hard hitting .45 ACP and carried in a beautifully tooled brown leather shoulder holster. Wardaddy attempts to goad Norman into killing an enemy soldier. Collier customized his sidearm with “sweetheart” grips made from scavenged plexiglass holding a photo of an unknown woman. Is this a photo of his fiancé Rose who died in Don’s whiskey fueled automobile accident? I believe so. The photo of Don’s lost love trapped within the lethal revolver neatly encapsulate both the dark and light of his tragic past. Wardaddy’s Smith & Wesson M1917 with its custom grips. Note his Lucky Strike cigarettes in the background. In addition to his treasured M1917 pistol, Wardaddy makes effective use of another firearm in the movie’s climactic battle, namely the German Sturmgewehr 44 assault rifle. Introduced late in the war, the StG44 is chambered in 7.92x33mm cartridge with a 30-round detachable magazine. The StG44 filled the tactical gap between the slow-firing and low-capacity magazine German Mauser rifle and the heavy hitting (and heavy weight) MG-34 and MG-42 machine guns. Wardaddy takes aim with his requisitioned StG-44. Undoubtedly, Wardaddy captured this rifle from a fallen German soldier and added it his growing collection of war trophies. December 18, 2017 - 10:23 pm Al K.
I loved this movie right up until the ending! Excellent job, W.T. Hatch! A great film, and obviously they went to great lengths to accurately portray the outfits of the WWII tankmen. Hopefully Wardaddy knew better than to be captured with the StG44 – the Nazis doled out very harsh treatment to anyone caught using a German weapon. I’m told the 3-buckle boots were well thought of but cavalry men took a very dim view of non-cavalry men wearing them. Paratroopers had the same opinion of their boots. An ex-soldier friend of mine told me one should always bow low to WWII armoured vets. Brave men one and all. They had to face up to the Tiger and sometimes even the King Tiger tanks which outgunned the Allied tanks of that era. Tanks a lot, Mr. Hatch.